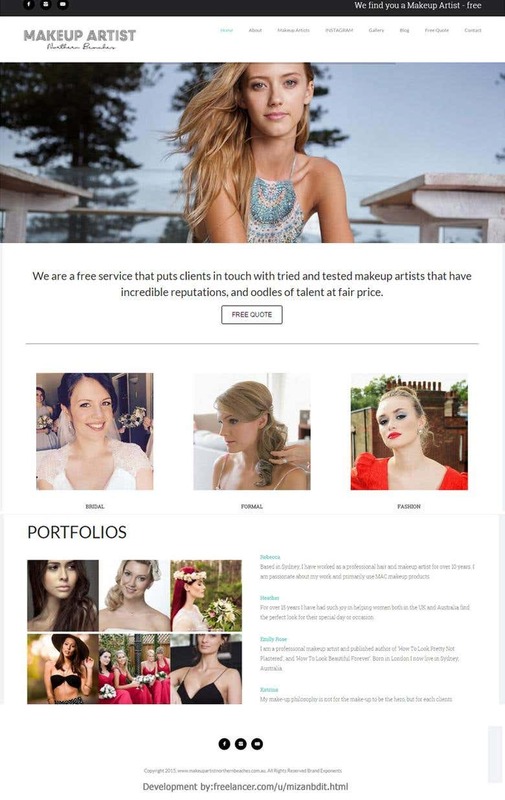 Design and Development makeup artists website on wordpress. I have 10+ years experiences on Website Design & Development, Speed Optimization, SEO, Linkbuilding, Internet Marketing, Social Media Marketing, Article Writing and more.. - Having experience on PHP-MySQL, HTML, CSS, JS, jQuery, Wordpress, Joomla, opencart, magento, pestashop to build Company website or E-Commerce store. - I use white hat method and latest SEO techniques for On-Page and Off-Page SEO to bring any webpage or keywords in the first page to increase traffic. - Website Speed Optimization solution for WordPress, Joomla or other websites to speed up, getting higher score at gtmetrix, google PageSpeed Insight, pingdom. - Provide Backlinks from HIGH DA, PA & MozRank sites to increase ranking. - Internet Marketing or Social Media Marketing. - Setup and Run Facebook or Adwords Campaign to get direct leads. - Unique content development. - Free Support. - Honestly working as a Full time freelancer. Happy to answer any related question. Please leave a message. Thanks.